As part of its 60th anniversary activities, the FSO is celebrating the youth of Northern Virginia by launching an exciting, new music education program for elementary students, grades 3 through 5. Created by Carnegie Hall, this new program unites the class room with the concert hall, giving students the opportunity to explore music through a year-long curriculum of classroom activities culminating in a concert in which students perform with the Fairfax Symphony Orchestra (FSO). Link Up has become a model for implementing high-quality arts education in schools across the country, and we are pleased to bring this acclaimed program to Fairfax County Public Schools. Click above to see teacher and student materials. 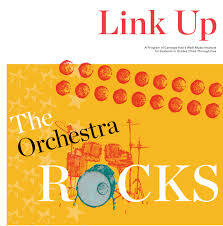 The Orchestra Rocks program provides student and teacher guides along with audio and video resources which are used to teach children basic music reading and to play simple pieces on recorder. The material presented can be tailored to the muiscal experience level of the students. For example, in September and October a general music teacher who sees their students once a week might use the Link Up materials for 10 minutes each class to introduce the recorder, while they also teach the basics of music reading. In November they might use half of their class to start to learn the basic recorder songs provided in the Link Up material. In January they might start teaching the more advanced version of the same pieces along with other material. All of which leads up to the concert with the orchestra where the students sing and play recorder versions of the pieces they have learned.